Rome, 12 October 2018 – The right to food is a fundamental pillar to the right to life. Yet it is also arguably the most violated human right globally. Today, hundreds of millions of children, women and men – 821 million people – remain food insecure. A new global civil society report launched today in Rome provides comprehensive data and analysis on this alarming contradiction. The report will be officially presented at the Global Thematic Event on the Right to Food Guidelines* at the 45th plenary session of the UN Committee on World Food Security next week. The world is not on track to reach the Zero Hunger Goal of the Sustainable Development Goals (SDG) in 2030. For the third year in a row, there is a rise in world hunger. According to the latest United Nations’ report on the State of Food Security and Nutrition (SOFI 2018), the absolute number of undernourished people, i.e. those facing chronic food deprivation, has increased to nearly 821 million in 2017, from around 804 million in 2016. “It is impossible to attain the Zero Hunger Goal without a radical change and a totally renewed commitment of governments towards policies which promote and protect our rights, the right to food, women’s rights, peasants’ rights, indigenous peoples’ rights, workers’ rights, and all human rights of the people most at risk or affected by food insecurity and malnutrition” says Ramona Duminicioiu from La Vía Campesina, CSM Co-Coordinator of the smallholder farmers’ constituency, from Romania. 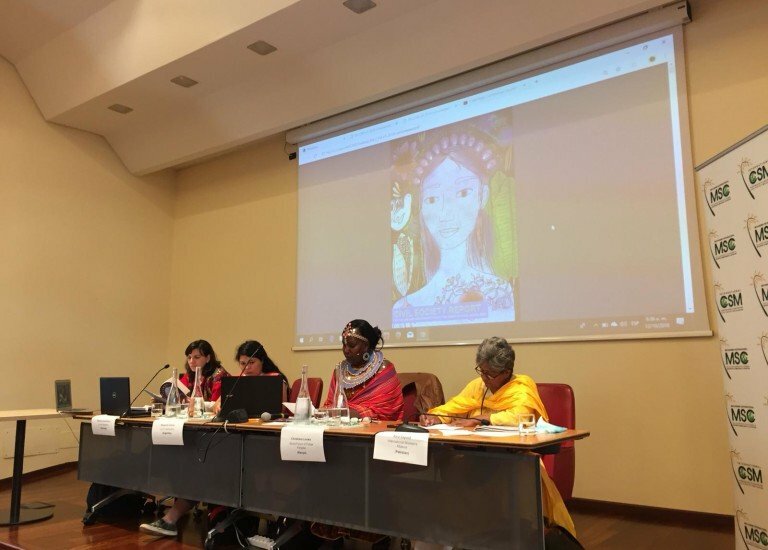 “Full respect to women’s rights is a precondition for an effective fight against the causes of hunger”, says Azra Sayeed from the International Women’s Alliance and Co-Coordinator of the CSM women’s constituency, from Pakistan. “There are still governments objecting our rights. Each day they do so, they prolong the systematic violations of our rights, and they tragically increase world hunger. In addition, globalization, militarism, feudalism and patriarchy are strongly connected to the current hunger crisis. Our struggles are also to fight and overcome these grotesque forces”, she adds. The Global Civil Society Report monitors a 14-years period (2004-2018) of worldwide implementation of the Right to Food Guidelines. The Right to Food Guidelines were adopted in 2004 by consensus of all member states of FAO. The report shows how the Right to Food Guidelines have been strengthened since 2004 by newly adopted international instruments and interpretations, and based on these, outlines an enriched normative framework for right to food implementation. The report provides an updated overview of countries introducing the right to food in their constitutions, and legal and policy frameworks. Finally, it analyses the patterns of ongoing violations of the right to food. “In this first effort at the international level to assess where we stand with the right to food realization – it is clear that current efforts are not working. We are off course and there is still a lot of work to do to ensure the realization of the right to food for hundreds of millions of people across the globe. In a moment where hunger and discrimination are increasing, and meeting SDG 2 seems increasingly elusive, it is time to step up and reaffirm human rights commitments and ensuring realizing the right to food is at the heart of efforts to reduce food insecurity”, says Nadia Lambek from the University of Toronto, a member of the report drafting team. “Next week’s CFS 45th plenary session (15-19 October) will be an outstanding opportunity to urgently engage in an in-depth discussion about the causes and drivers that have led to today’s alarming situation, and to mobilize a new global commitment for a way-out”, says Margarita Gómez, Co-Coordinator of the CSM Youth Constituency, from Argentina. “Business-as-usual is not an option: it would continue to destroy the livelihoods of our communities, and the dreams of millions of young people of our and future generations”. The new Global Civil Society report on the Right to Food can be accessed here. * The Right to Food Guidelines (complete name: “Voluntary Guidelines to Support the Progressive Realization of the Right to Adequate Food in the Context of National Food Security”) were negotiated through a participatory process in the Committee on World Food Security (CFS) and adopted unanimously by all member states of the United Nations Food and Agriculture Organization (FAO) in 2004. Since their adoption, the RTF Guidelines have been used to assist states in adopting national strategies, and constitutional and legislative changes towards realizing the progressive realization of the human right to food.